The noted research psychiatrist and New York Times bestselling author explores how Transcendental Meditation permanently alters your daily consciousness, resulting in greater productivity, emotional resilience, and aptitude for success. Most of us believe that we live in only three states of consciousness: wakefulness, sleep, and dreaming. But there is so much more. 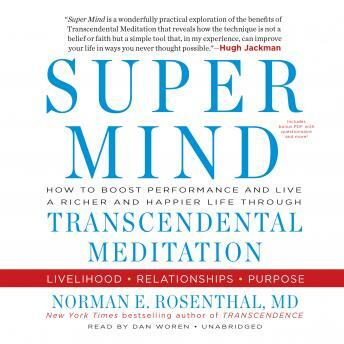 In Super Mind, clinical psychiatrist and bestselling author Norman E. Rosenthal, MD, shows how the incredibly simple daily practice of Transcendental Meditation (TM) can permanently alter your state of mind during the routine hours of waking life—placing you into a super-mind state of “cosmic consciousness” where you consistently perform at peak aptitude. In his most ambitious book yet, Rosenthal shows how TM is more than a tool for destressing or for general wellness. It is a gateway to functioning physically, emotionally, and intellectually at levels we never knew we could attain. Written in Rosenthal’s trademark style of restraint and intellectual carefulness, Super Mind explores how we can aspire to so much more than we ever thought possible.